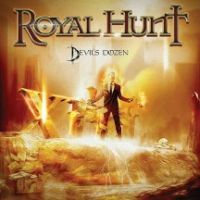 It’s been nearly 25 years since the band’s debut release, and it seems that Royal Hunt are never going to flog us a duff release. And that’s really nice of them. It's an intensely packed sonic ride this one. Royal Hunt’s vision dwells in challenging song structures, crunch riffs, fat-layered keyboards and ear friendly melodies, all topped with mountain high choruses. D. C. Cooper is the band’s primary weapon, his voice being full of personality and charm. Equally important, though, are the songs; and “Devil’s Dozen” tows some truly terrific material. “May You Never (Walk Alone)” puffs power metal like urgency and the “Heart On A Platter” is pure epic rock bliss, while “Until the Day” is an exquisite ballad. The use of synthetic orchestration drags the album further towards the theatric territory, once such example is “A Tear in the Rain”, which sound like a number Hammerfall forgot to write some 20 years ago. The folkish “Riches to Rags” goes down much better, with magnificent vocals, creative keys work and a stirring guitar solo making themselves at home like old friends. It is range and versatility like this that makes Royal Hunt a hard act to beat.